Bill Crumbleholme made a repeat appearances at English Heritage's big living history event at Kelmarsh near Northampton, together with a band of other people inspired by the Bronze Age. "This year sees an expansion of the prehistoric activities on display, with a Bronze Age encampment being featured. Bill Crumbleholme, a professional potter who specialises in authentic replica Beaker Pottery, is joined this year by other Wessex people to create a wider display of Bronze Age life. Members of the Age of Bronze group provide examples of everyday materials and construction techniques, including buildings and coracles. 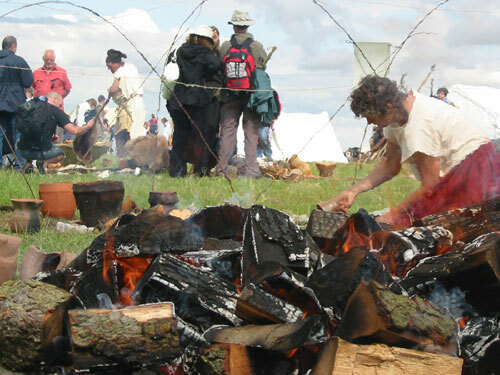 Practical artisans demonstrate methods of producing the items on display, including the making and bonfire firing of Beakers and Urns, spinning and weaving textiles, designing clothing, carving wood, working with metals, fashioning jewellery and preparing food from seasonally available sources. Examples of some of these are also on sale. The camp shows how well they coped with life and were highly capable of producing a range of useful and well designed artefacts. All the team are happy to discuss the Bronze Age with visitors of all ages and levels of knowledge, they show the evidence for what is being done and interpret the displays from a modern perspective. www.beakerfolk.co.uk gives more details including further events such as the Living History display at Durrington Walls, near Stonehenge. " Follow this link to see images of the 2007 event. Follow this link to see images relating the 2006 event. Follow this link to see images relating the 2005 event.